What happens after you upload your artwork? We want your graphic files to print without fuss and look exactly like you meant them to. Even if you’re a seasoned professional and are used to supplying files for print, please read these guidelines anyway – our process is likely to be different to what you’re used to. If you’re designing something complicated, please contact us before you start or look at our ‘How To’ guides. Upon receipt of your PDF, we’ll perform an "automated FileCheck" of your file with our preflight software, to ensure that it meets our production requirements. Our software is industry leading, and will correct many common issues ready for print. (Unless one was requested online at the time of your order, see below image for further details). 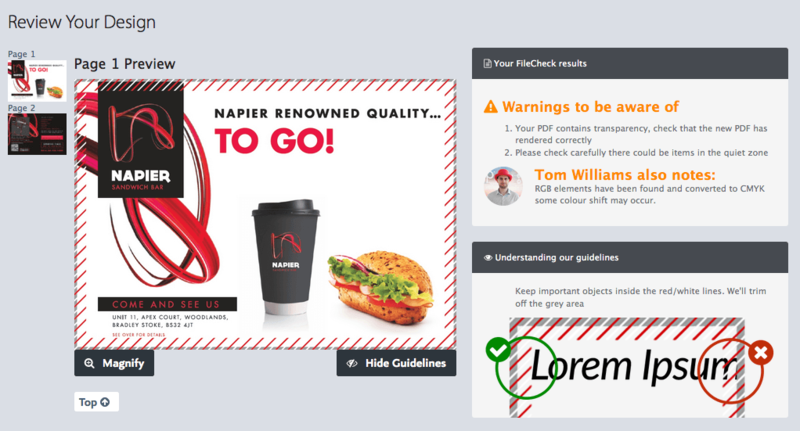 If errors have been found and corrected that change the visual look of your graphic file then we’ll send you the results of your FileCheck with a list of found issues and what has been corrected. To ensure your job is sent to print on the day of your order, we must receive your final online approval by 9pm. If your PDF fails our preflight then we will request a new file. If you can’t correct the issue, you can select 'fix my file' and one of the central team will be able to assist. These products usually have Die-cut, Spot UV, Foil or Embossed elements in them and require extra attention. Special Care products also include Booklets, Perforated Leaflets and all Fabric products, which are more complex or carry a higher value. These products can take up to 4 hours to check and they are reviewed and proofed by a member of our Preflight Team. Basic products such as flat and folded leaflets and business cards are proofed directly from our automated preflight software shortly after your order has been placed. If your order is urgent please refer to our file supply guide to ensure your file is supplied in a "print ready" format to avoid delays. Resupplying your files and requests to fix files received after 4pm will add 1 working day to your order. To avoid delays please refer to our File Supply Guide to ensure your files are supplied in a "Print ready" format. From your Basket you can elect to receive a proof for each job, to not receive a proof or to receive a proof only if we spot issues. When you receive the results of your FileCheck please review all Warnings and Fixes before approving your job for print. If you have any questions regarding your online proof please give us a call. Yes, absolutely. We prefer PDF files, but if you don’t have one then we’ll be able to work with your native files. Please contact us to discuss your project further. Please make sure you have read our the minimum essential guidelines before sending your files to us. Generate 'assured artwork templates' from within InDesign for 99% of our product range, using InDesign Scripts. Avoid delays, avoid resupplying files and streamline the ordering process. Download our InDesign Scripts here. Your cental support team all have a background in graphic design and are well versed in designing for print. If you would like some more information or advice when setting up your graphic files, please get in touch on hello@marqetspace.com or call us on 0800 612 6240.